Last month’s monster book giveaway closed at the weekend, and the winners have now been drawn*. Check your email to find out if you’ve been selected. The SONGS giveaway was massively over-subscribed, with 240 valid entries to TRINITY’s 49 – that’s almost 6 to 1. This was largely because so many of you hadn’t read my books before, or didn’t specify a book and so got entered into the SONGS draw, or you were cheeky and asked for either or both. Lots of you are called Mike (7). Even more of you are called Chris (9). A surprising number (43, or 15%) have names beginning with the letter J. There was even one lady named Ellie, like me (but it didn’t earn her any special favours). A couple of wee scamps commented more than once. One looks like an accidental double post, so he gets a pass. As for the others, yes, I de-duped your email addresses. I’ll hold my hand up and say multiple entries were not explicitly prohibited, and it’s entirely possible that WordPess screwed up (perish the thought) but in the spirit of fair play, you got one entry each. Monster book giveaway – now even monsterer! Whilst we’re on the subject of fair play, the extremely high number of entrants for SONGS left me minded to throw a few more books into the pot, so I have drawn a total of TEN winners for that one. If I could have offered six times as many, i.e. 42, to give everyone a more or less equal chance of winning, whichever draw they were entered for, I would do, but alas Tor only sent me so many copies. SONGS OF THE EARTH winners: Steve, Haik, Daniel, William, Shelley, Matt, Paras, Linus, Sarah, Nadine. TRINITY RISING winners: Debbie, Lorraine, Mark, Kirsten, Aaron, Shawn, David. Congratulations, all of you! You will shortly receive an email requesting your address and personalisation details, and your books will go on the post on the Saturday after I receive your reply. * For all those interested in due process, the winners were selected by importing all the commenters’ names, deduping and sorting into two lists, then I used a random number generator to select positions on those lists. Folks, I need to clear some space on the shelves in my office. Gollancz just sent me another bunch of paperbacks, and there is no length to which I will not go in order to avoid dusting ’em, so the time has come to run another giveaway. 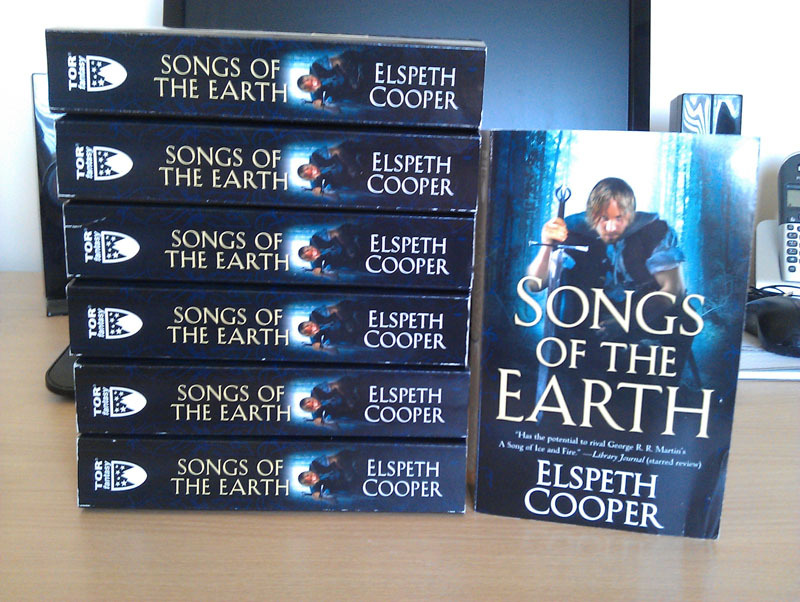 First up, I have seven copies of the Tor paperback of SONGS OF THE EARTH to give away. Many of you will have aready read this, but I am reliably informed that there are people out there in internetland who haven’t yet heard of me (waves to the good folk of Reddit Fantasy) so here’s your chance to try a new-to-you author for free. You never know, you might even like it. 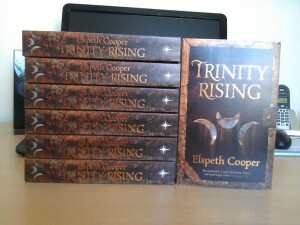 Second, I am giving away seven copies of the larger format UK paperback of TRINITY RISING. These are the not due in the shops until June 13th, so they’re new and shiny and unthumbed. Free stuff, people. Who doesn’t love free stuff? Oh, and I’ll sign and personalise each book, too. This giveaway is open worldwide – all you have to do is leave a comment on this post before midnight UK time on June 15th, and tell me which book you want, then I will put all the names in a hat and select the lucky recipients at random. When you comment, please make sure you give a valid email address so I can contact you for your shipping addy and personalisation details when the giveaway ends. 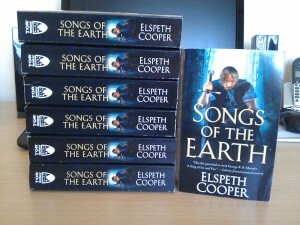 UPDATE: If you’ve not read my work before, you should start with SONGS OF THE EARTH as it’s Book 1 in the series. 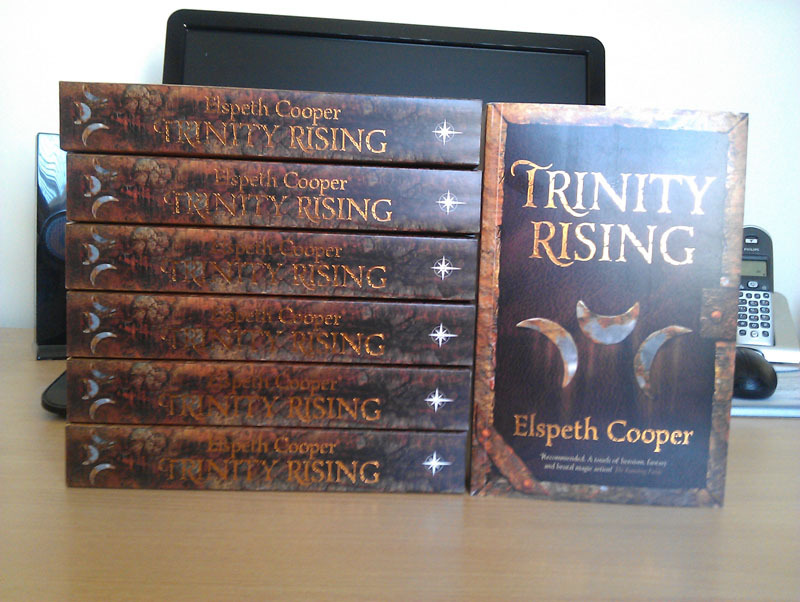 TRINITY RISING is Book 2. If you don’t specify which book you’d prefer, I’ll put you in the hat for SONGS. UPDATE the second: If your comment does not appear straight away, my apologies, but due to a rise in comment spam I have to manually approve new commenters. I’m training the cats to monitor the feed in my absence.